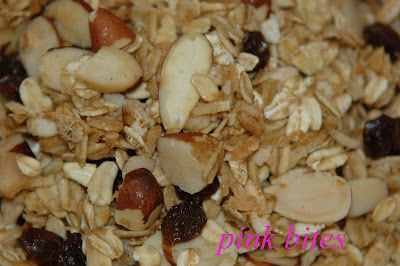 Pin It Granola is the type of recipe that anyone can adjust and adapt to their own taste. It's almost impossible to mess it up. This is my version. I looked at many different recipes and came up with this one that is adapted mainly for Andrew's taste, who eats it everyday for breakfast. I like to sprinkle it over yogurt, or a nice bowl of Brazilian açaí with some sliced bananas. I always make a double batch as the recipe can be easily doubled, and it goes really fast here at home. Preheat oven to 250 degrees F. Combine first six ingredients. On a separate bowl, mix maple syrup, oil and salt until combined. Combine both mixtures well and spread it on a rimmed baking sheet pan. Bake for 1 hour and 15 minutes. 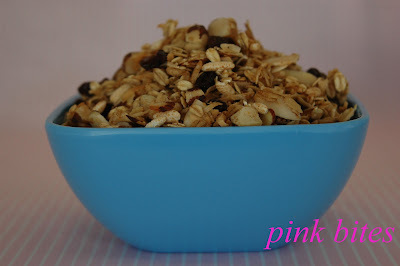 Add raisins and keep it in an air-tight container. I love Brazil nuts, besides adding a personal touch to this recipe, they are full of mood-lifting selenium and are also rich in zinc. I think macadamia nuts will be a good substitute as well. 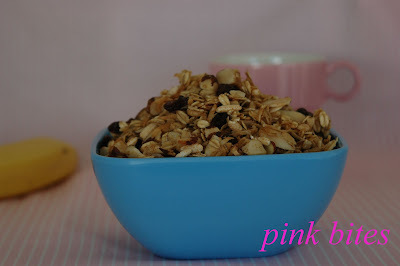 But remember, there are no rules, use any nut, fruit cereal you like best and create your own granola.